We ended up staying at the anchorage in Bass Harbour for a few weeks rather than the few days we had intended. Firstly it was the social life in Kuah. Who’s going to say no to an invitation to a seafood barbeque, I ask you? That was so much fun, we made new friends and it was a hell of a delicious spread. Then it started raining. And didn’t stop for six days. Forget sailing in torrential downpours and associated white outs during the sumatras. Finally when the weather cleared it was the end of Ramadan and Merdeka (Independence Day) holidays. All the shops were closed for more than a week so we couldn’t buy fresh provisions. Finally we weighed anchor on 4 September. 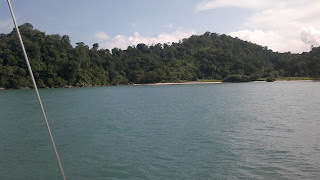 We spent the first couple of nights at a beautiful anchorage on the north side of Pulau Bumbon, just around the corner from Kuah. A magic spot with a sweet little sand beach and oh joy a fresh water well. I love swimming in the ocean, but it’s always lovely to rinse off the salt at the end of the day. It was a change waking up to bird call rather than the call to prayer. And eating plain old home made steak and mash rather than spicy Malaysian and Thai food.